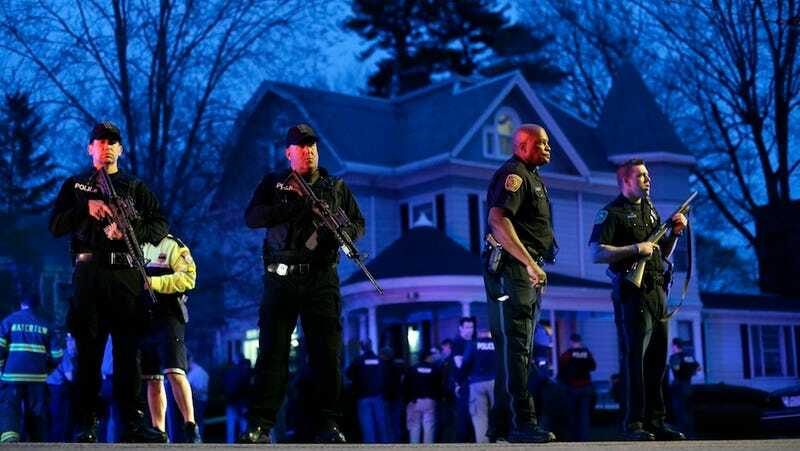 At 7:00, less than an hour after police announced at a press conference that authorities had no idea where suspect Dzhokhar (Jahar) Tsarnaev was, reports flooded in that shots were been fired, and a major police action was taking place in Watertown. At 8:45, it was over. Chronological updates, starting at 7:00. Journalists on the scene reported "dozens" or even "hundreds" of shots, as well as gas canisters fired. Armored vehicles and ambulances raced to the scene soon after. According to the Globe, WCVB Boston, and Fox News, police were investigating a boat in a backyard when shots broke out. It's not clear who fired first. Boston mayor Tom Menino tells WBZ that the surrounded person is indeed Dzhokhar Tsarnaev. And immediately contradicting that, chatter over the (not always reliable) police scanner says there is movement in the boat: "He just sat up." Via scanner traffic, they are apparently going to fire flash-bang grenades. "Stand by for the bang. Do not return fire." 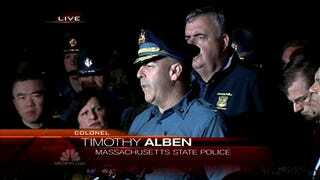 WCVB reports 6-7 bangs, most like the flash-bangs grenades. Scanner traffic says they landed well away from the suspect. According to the scanner, a group of media are trying to sneak closer to the scene (B) by crossing the field from the end of Parker Street (A). The scanner now requests officers to chase media off a nearby roof. 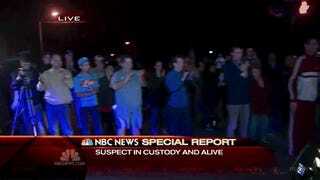 The suspect is in custody. It happened just before 8:45 p.m. He is alive, though a medic has been dispatched. The Globe reports an ambulance heading through the barricades to the scene. He is in the custody of the FBI, who had been leading the investigation from day one. There's applause from police and spectators near the scene as the news spreads. It's not immediately clear how Tsarnaev was taken. Authorities were aware that their scanner was being listened to online, and chatter was kept to a minimum before whatever it was that ended the standoff. Scanner: "Excellent job, excellent job." NBC reports that Dzhokhar Tsarnaev suffered at least one gunshot wound. Every vehicle leaving the scene is getting applause from assembled spectators. The driver of an armored SWAT vehicle: "Thank you, it was a pleasure." The suspect is listed in serious condition at Beth Israel Deaconess Medical Center. This post is no longer being updated. Check the front page for further developments.